A Santoku is a Japanese all-purpose kitchen knife. 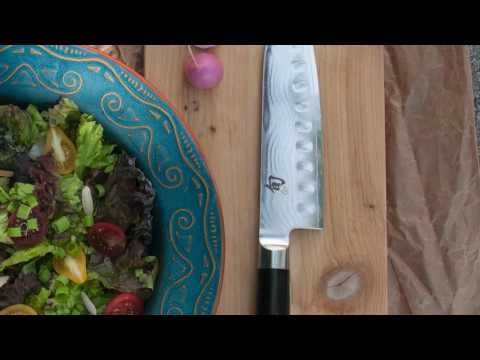 Like a chef’s knife, the Santoku is used for just about every cutting job in the kitchen. The name means “three virtues.” Depending on who you ask, the name refers either to the three types of foods it works well with vegetables, poultry, and fish or for the three types of cuts at which it excels; slicing, dicing, and chopping. Hollow-ground indentations on the blade help reduce friction so the blade glides through the food more easily. When Kai first introduced the Shun Classic Hollow-Ground Santoku to the market, it was named “Kitchen Knife of the Year” by Blade magazine. The Shun Classic Hollow-Ground Santoku is part of the Shun Classic line of tasteful and contemporary cutlery. Originating in Seki City, Japan’s historical center for manufacturing samurai swords, Kai Shun is heir to a seven-century tradition of superior workmanship. Kitchen cutlery for the ultimate knife connoisseur, Kai’s Shun Classic line features proprietary high-performance VG-MAX ”Super Steel” that is clad with sixteen layers of stainless steel to create a stunningly beautiful rust-free San Mai damascus blade. The blade profiles are precision ground and etched to reduce sticking, resulting in less damage to the food being cut and faster prep times. Ebony-black Pakkawood handles are ergonomically designed with a ‘D’ cross-section, featuring offset stainless steel bolsters for maximum comfort and control. Stainless steel end caps complete the design for added beauty and durability. Every Shun Classic knife is an outstanding example of form fulfilling function. The Shun Classic line also offers you the widest assortment of both traditional culinary blade shapes and contemporary cutting-edge designs, so you will always find the right knife for the task.